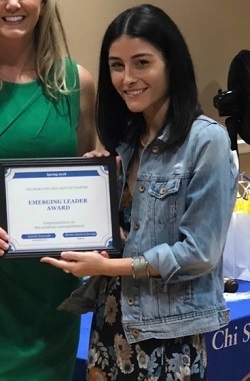 Danielle Panariello was honored at the "Spring 2018 Chi Sigma Iota - Beta Rho Chi's Grand Banquet and Induction Ceremony", which was held on Thursday, April 12th. 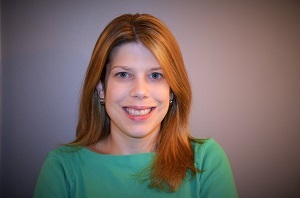 Additionally, Danielle has been featured on the Department of Counselor Education's April 2018 Student Spotlight (read more). 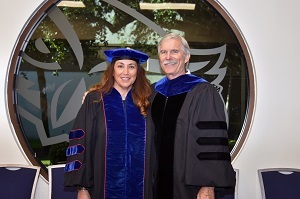 3/5/18 - Congratulations to Ayse Torres, Ph.D., for receiving "2018 COE Outstanding Dissertation Award"
Our recent doctoral graduate, Ayse Torres (Ph.D., 2017), was recognized for her ground-breaking research in her dissertation entitled, "The Impact of Motivational Interviewing Training on Rehabilitation Counselors Assessing Working Alliance and Client Engagement: A Randomized Control Trial." Dr. Michael Frain served as committee chair, and Dr. Charles Dukes and Dr. Greg Brigman served as members on the committee. The accomplishment will be recognized at the College of Education Honors Ceremony on Thursday, May 3, 2018. 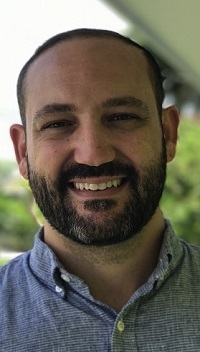 Dr. Bowers, Assistant Professor of School Counseling, was among the new faculty and staff members introduced to the FAU community at the College of Education event. 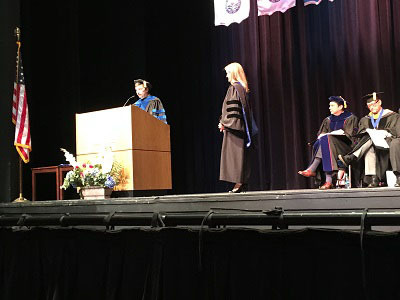 Dr. Cheryl Bottini, one of our recent Ph.D. graduates, celebrated her achievements at the Summer 2017 Commencement Ceremony. According to Association for Assessment and Research in Counseling (AARC), "the new 2016 impact factor for the Measurement and Evaluation in Counseling and Development journal (MECD) increased from 0.902 to 1.047.The 5-year Impact Factor now stands at 1.364, and MECD is ranked 43rd out of 58 journals in the Psychology Educational category." To read the journal, check out the website. "Predicting Dropout in Counseling Using Affect Coding of the Therapeutic Relationship: An Empirical Analysis" is featured in the April 2017 edition of JCD. It is written by Ashley J. Luedke (Ph.D., 2013), Paul R. Peluso (Ph.D.), Patricia Diaz (Ph.D. candidate), Robert Freund (Ph.D., 2016), and Andrew Baker (Ph.D. candidate). To access the article, visit the journal's website. 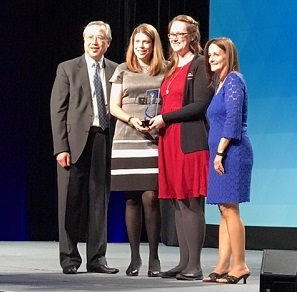 Dr. Emelianchik-Key and her co-authors, Dr. Amanda LaGuardia and Dr. Rebekah Byrd (not pictured), were recognized for their research at the Awards Ceremony. 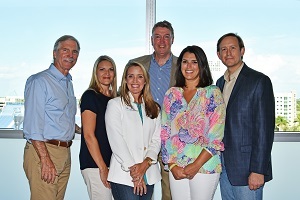 Counselor Education faculty, and current and former students, were proud to represent Florida Atlantic University at one of the most exciting national counseling events of the year! 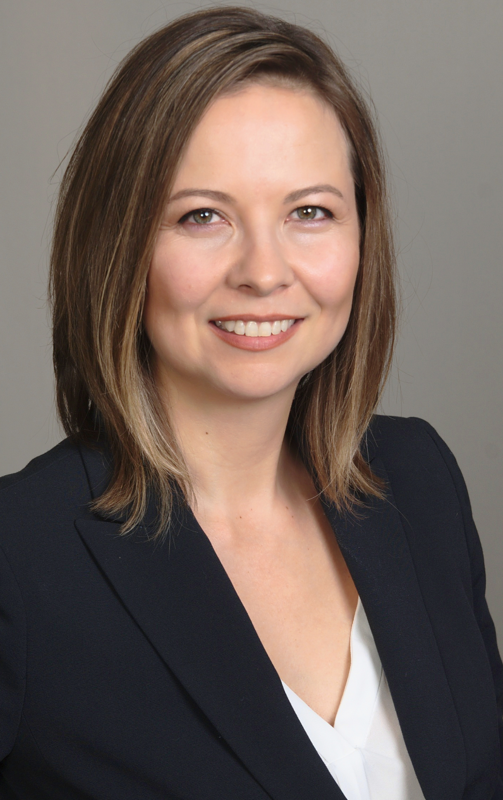 Dr. Emelianchik-Key is identified as an honoree for the Best Practices Research Award. For more information, visit the ACA website. 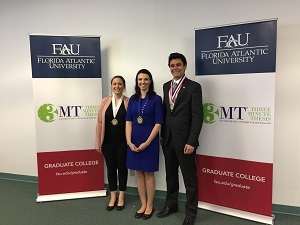 Here, the FAU 3MT Heat 4 Winner delivers a stunning performance as she speaks on her dissertation topic, "Reflective Practice and Student Counselors' Case Conceptualization Skills." 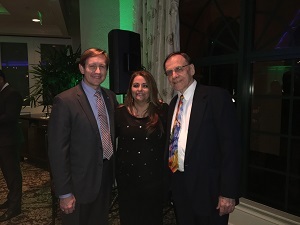 11/4/16 - Dr. Len Sperry wins "Community Impact Award for Education Excellence"
On November 3, 2016, Dr. Len Sperry was recognized for his tremendous achievements at the 2016 Faulk Center for Counseling Community Impact Awards. It is not easy to summarize a dissertation in three minutes (or to do so with style and grace), but Vassilia gave an impressive performance. 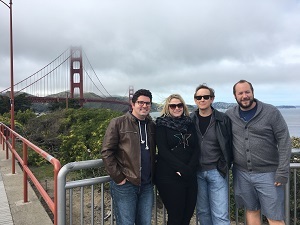 Our Clinical Mental Health faculty rang in the Fall 2016 semester by welcoming new additions to the Counselor Education team, including Dr. Brian Canfield (Professor), and a new staff member, Mikaela Kursell. 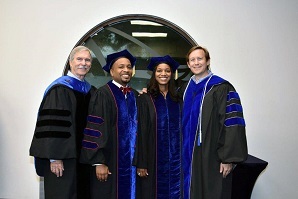 Two of our Ph.D. candidates were happy to celebrate their achievements during the Commencement Ceremony on August 9, 2016, held in the Carole and Barry Kaye Performing Arts Center. AARC credits and congratulates Dr. Peluso, Editor-in-Chief of MECD, and the rest of the editorial team for helping the journal to "nearly double its scholarly importance" in the last year. According to Association for Assessment and Research in Counseling (AARC), "MECD has the highest impact factor rating of any ACA journal with an impact factor of .902!" 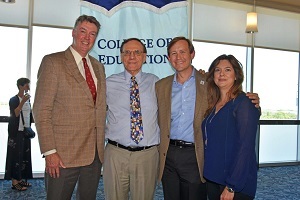 The College of Education celebrated the remarkable achievements of Dr. Greg Brigman, who received COE Researcher of the Year; Dr. Elizabeth Villares, who was recognized as COE Scholar of the Year (Associate Professor); and Dr. Mariani, recipient of the COE Scholar of the Year award (Assistant Professor). 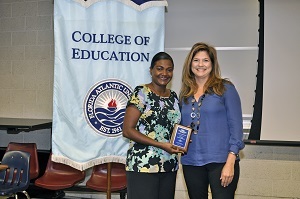 Cindy Khan-Jordan was presented with the award at the College of Education's Honors and Awards Ceremony. 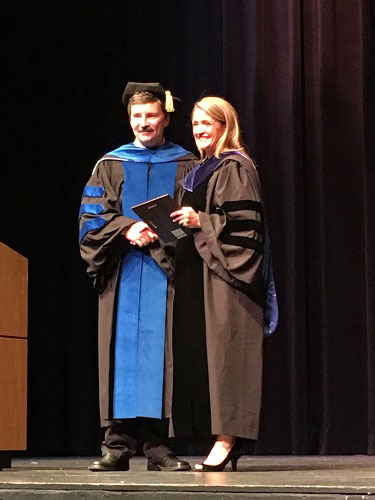 Dr. Mariani is one of six winners of the 2016 Scholar of the Year Award who was presented with a plaque at the 47th Annual Honors Convocation last week. For a complete list of winners, visit the website. 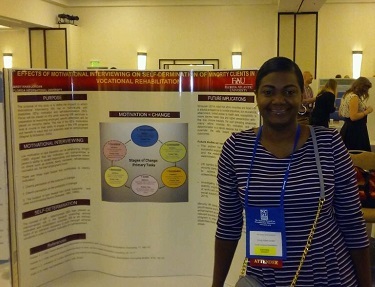 Cindy Khan-Jordan's scientific poster presentation, titled "The Effects of Motivational Interviewing on the Self-Determination of Minority Clients in Vocational Rehabilitation," was ranked #15 out of 145 presentations. 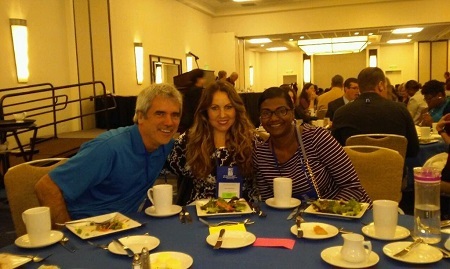 After a busy day of panels and poster presentations, the Clinical Rehabilitation group break bread at the National Council for Rehabilitation Educators conference. 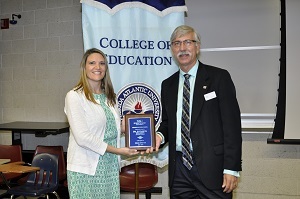 In recognition of her outstanding achievements in research, Dr. Melissa Mariani receives the 2016 Scholar of Year Award at FAU's 47th Annual Honors Convocation.